Summer’s heat can only be beaten by a few things and coconut water pineapple popsicles ranks among them. Summer is hot, but that doesn’t mean you have to stay indoors with the air conditioning on full blast to stay cool. Coconut water used around the world to quench thirst and cool down the body. When combined with pineapple juice and stuck in the freezer for a few hours, the result is a freezing thirst quencher. Add in a few raspberries and drops of lime in there, and you have yourself a delicious coconut water pineapple popsicle. Whether you decide to purchase all the fruits individually, or from the bottle, either works! Just be sure to buy enough of each fruit. Place 3 raspberries in each mold, and depending on the size of the mold, they may need to be f0rced in. Combine all the ingredients into a bowl and stir. Using a funnel, fill each popsicle mold and place foil over the top of the popsicles. Create small slits on the foil to insert the popsicle sticks. To release the airtight seal the molds have on the popsicles, run under hot water. This will melt a thin layer of the popsicle that has frozen onto the mold and make it a lot easier to slide out. 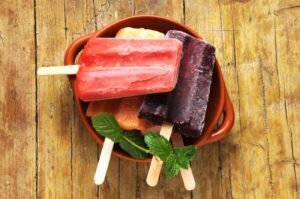 We at Pierce Insurance Group use this recipe to cool down during the summer and share this recipe to all of your friends that may also need a proper cool down using the joys of childhood. To get a quote for all of your insurance needs, contact Pierce Insurance Group today!